SRG Reports on Its Cobalt-Nickel-Scandium Gogota Project – SRG Graphite Inc.
Montreal, Quebec, January 23, 2018 – SRG Graphite Inc. (TSXV: SRG) (“SRG” or the “Company”) today announced the resumption of activities at the cobalt-nickel-scandium project, known as the Gogota deposit at the Company’s Lola Project in Guinea. SRG will be resuming activities on the Gogota deposit and expects to file a National Instrument (“NI”) 43-101 compliant maiden mineral resource estimate in H1 2018. SRG acquired the Lola project from Sama Resources in a transaction in 2016. 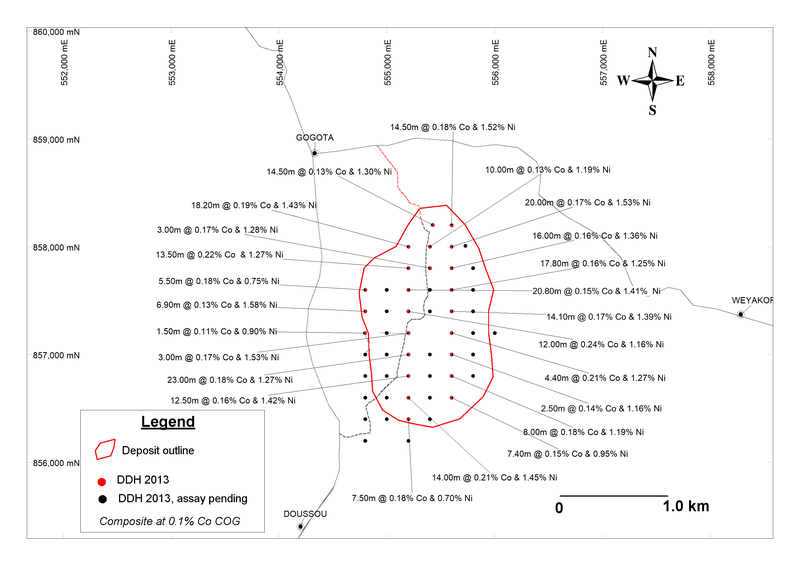 The Gogota deposit was discovered during a regional exploration program carried out over portions of the Lola project in 2013 (reference Sama Resources’ press release dated March 7, 2013). Of the 51 vertical drill holes carried out over the Gogota Deposit, 31 were drilled over a 200-meter by 400-meter grid and 20 were drilled over a 200-meter by 200-meter grid. The first phase of samples from 31 drill holes representing 800 samples were sent for analysis and returned significant cobalt (“Co”), nickel (“Ni”), and scandium (“Sc”) results, among others. The second phase of 20 drill holes representing 425 samples, which are still pending, have been sent to the lab for analysis. Mineralized intervals defined using 0.10% cobalt cut-off grades. Core logging and sampling were performed at SRG’s facility in Gogota village. Sample preparations were performed by Bureau Veritas Mineral Laboratory’s facility in Abidjan, Ivory Coast (“BVML”), and then dispatched by BVML directly to their assay laboratory, Inspectorate Metals and Minerals, in Rustenburg, South Africa. All samples were assayed for cobalt, nickel and all major oxides using peroxide fusion XRF. Scandium was determined by inductively coupled plasma optical emission spectrometry. Compilation maps of Gogota are available on the Company’s website or via the following links. The technical information in this release has been reviewed and approved by Dr. Marc-Antoine Audet, P.Geo, President and CEO, SRG and a ‘qualified person’ as defined by National Instrument 43-101, Standards of Disclosure for Mineral Projects. 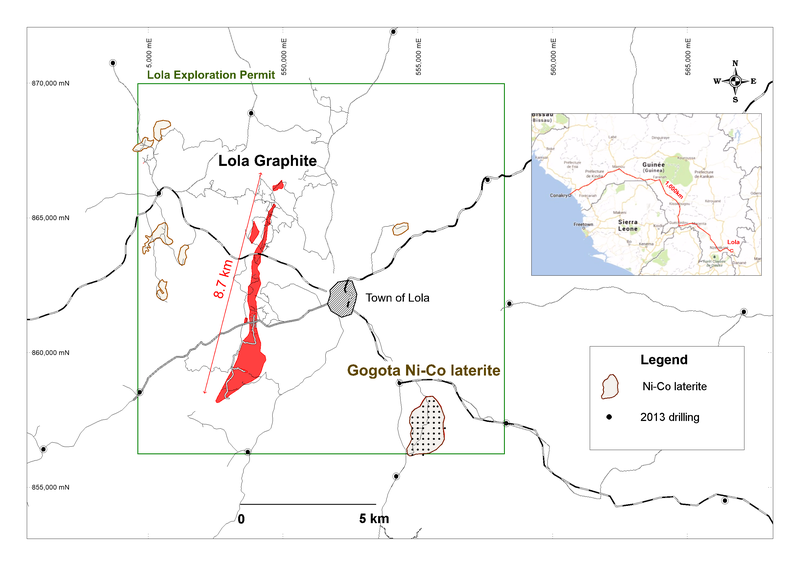 SRG is a Canadian-based company focused on developing the Lola graphite deposit located in the Republic of Guinea, West Africa. SRG is committed to operating in a socially, environmentally and ethically responsible manner. This press release contains “forward-looking information” within the meaning of Canadian securities legislation. All information contained herein that is not clearly historical in nature may constitute forward-looking information, including references to the plans and project of the Company such as proceeding with production at the Company’s Lola Project, proceeding with exploration activities on its permits including Lola and Gogota. Generally, such forward-looking information can be identified by the use of forward-looking terminology such as “potential”, “high-potential”, “expected”, “optimistic”, “looking forward”, “moving forward”, or variations of such words and phrases or state that certain actions, events or results “may”, “could”, “would” or “might”. Forward-looking information is subject to known and unknown risks, uncertainties and other factors that may cause the actual results, level of activity, performance or achievements of the Company to be materially different from those expressed or implied by such forward-looking information, including but not limited to: (i) volatile stock price; (ii) the general global markets and economic conditions; (iii) the possibility of write-downs and impairments; (iv) the risk associated with exploration, development and operations of mineral deposits; (v) the risk associated with establishing title to mineral properties and assets; (vi) fluctuations in commodity prices; (vii) the risks associated with uninsurable risks arising during the course of exploration, development and production; (viii) competition faced by the issuer in securing purchasers, offtakers markets, clients and experienced personnel and financing; (ix) access to adequate infrastructure to support mining, processing, development and exploration activities; (x) the risks associated with changes in the mining regulatory regime governing the issuer; (xi) the risks associated with the various environmental regulations the issuer is subject to; (xii) risks related to regulatory and permitting delays; (xiii) risks related to potential conflicts of interest; (xiv) the reliance on key personnel; (xv) liquidity risks; (xvi) the risk of litigation; and (xvii) risk management. Forward-looking information is based on assumptions management believes to be reasonable at the time such statements are made, including but not limited to, continued exploration activities, no material adverse change in metal prices, exploration and development plans proceeding in accordance with plans and such plans achieving their stated expected outcomes, receipt of required regulatory approvals, and such other assumptions and factors as set out herein. Although the Company has attempted to identify important factors that could cause actual results to differ materially from those contained in the forward-looking information, there may be other factors that cause results not to be as anticipated, estimated or intended. There can be no assurance that such forward-looking information will prove to be accurate, as actual results and future events could differ materially from those anticipated in such forward-looking information. Such forward-looking information has been provided for the purpose of assisting investors in understanding the Company’s business, operations and exploration plans and may not be appropriate for other purposes. Accordingly, readers should not place undue reliance on forward-looking information. Forward-looking information is made as of the date of this press release, and the Company does not undertake to update such forward-looking information except in accordance with applicable securities laws.